Our story begins in the basement of a church that housed a preschool I was considering for our son Ryan, age 5, and our daughter Devon, age 4. I was scared. I was hating the fact that I had to send them out there into the world. Who would take care of them? How would they be loved during the day? Will they be safe? As a parent, I want our families to feel all those things I felt standing in that school room doorway so many years ago. We hire amazing instructors who are happy spending the day crafting with your kids. We focus on making your children feel good about themselves, feel that they are cared for during classes and camps and that their work matters. Hugs and giggles are part of our daily routine. My daughter has been taking classes at the Handwork Studio for over two years. All the teachers have been amazing! She loves to sew and has progressed to machine sewing and making her own clothes at just 8 years old. Everyone at The Handwork Studio is so helpful and approachable. They respond to all our questions right away and make her feel welcome there. We have been so happy there. My 5 year old has just started taking classes there as well and is loving it! The Handwork Studio has been the most amazing gift I could give my daughter. The instructors are not only teaching her skills that she can use throughout her entire life, but are instilling confidence and values in her. I'm thrilled that my daughter not only thinks of the staff at The Handwork Studio as teachers, but as role models as well. 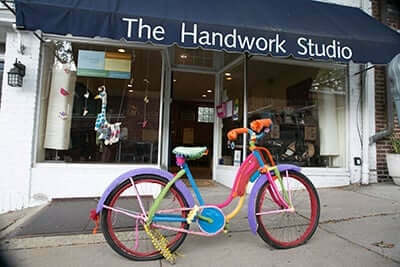 In today’s world of social media and tween pressures, The Handwork Studio is a breath of fresh air where creativity and learning are encouraged and children/tweens can just be themselves. Laura has worked with kids since she was 10 years old, from babysitting, to being an RA in college, to an au pair in Germany, to watching her neighbors' kids while she took a sabbatical from work. Kids have always been a re-occurring theme in her life and her love of kids the basis of our philosophy at The Handwork Studio. Her professional career involved working in NYC - first in the travel industry then on Wall Street for a consulting firm that specialized in financial institutions. In those two careers, she put to use her marketing degree that she earned from Northeastern University. Laura's crafting experience was limited as a child of the 60's and 70's. Her mom didn't really do much of it as the feminist movement was in full swing and it was seen as traditional women's work. So she never grew up surrounded by crafting. She had always longed to be an artist and took up knitting after the birth of her daughter, but like many mothers today, she never made time for herself. However, Laura's experience as a mother to her two grown children, Ryan 22 and Devon 20, and her desire to build a business brought her to The Handwork Studio. She's spent the last 17 years developing a curriculum and business around the idea of making handwork, machine sewing and fashion available to kids. Today we work with independent schools, the Girl Scouts and Art Centers to develop workshops, camp programs and in-house classes teaching thousands of kids the joys of needle arts. Julia has been an integral part of The Handwork Studio for the past 13 years. With a BFA in Fine Arts from Green Mountain College, she has dedicated her work to bringing needle arts and fashion education to kids through camps, workshops, and classes. As our Executive Camp Director, Julia leads our staff of skilled instructors to run our award-winning summer program that reaches thousands of kids each summer. In between camp and planning for camp, Julia loves going on adventures with her husband, son, and 15 year old beloved Australian Shephard.